Paul is a barbecue enthusiast. He is currently grilling and smoking on a Komodo Kamado Ultimate 23. Two whole primal cuts of beef aging. I‘m a big fan of the rich aroma and flavor of dry-aged beef. It has a distinct, almost-cheese-like flavor; a funky, deep smell; and is tender like no other steak. The problem is that it’s so damn expensive. I picked up two USDA Prime bone-in rib eyes that were aged over 40 days, and it cost $26 per pound. Without the bone, it’s $32 per pound, and the leaner New York strips are $24 per pound. For my family of five, it easily tops $100 to buy dry-aged steaks for a bbq dinner. 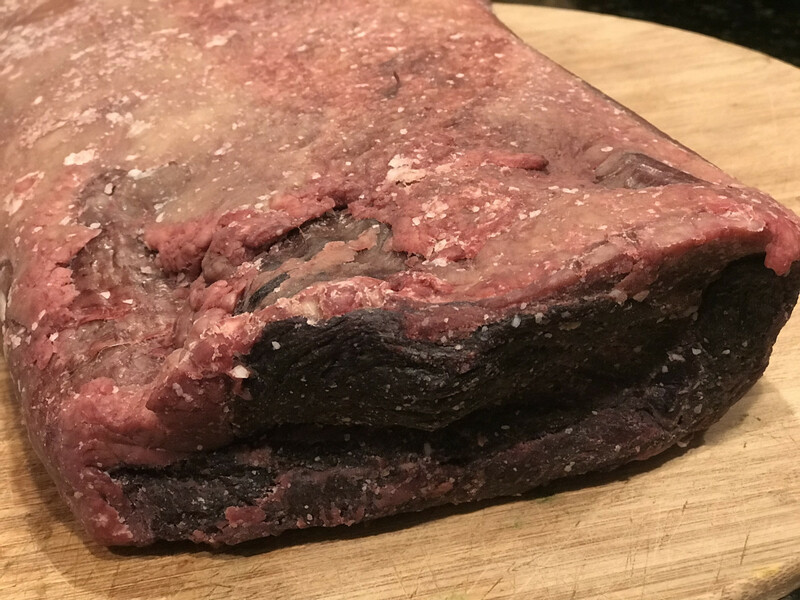 So, I came home and told my wife that I love dry-aged beef, but we can’t afford it, so I need to figure out how to make it myself. First, I went to my butcher and asked how to do it. I got some pretty basic instructions. Get a mini fridge with racks big enough to hold a very large cut of beef - up to 20 lbs. Put a fan it it and set it on low. Get a UV-C light to kill bacteria in the fridge. Get a gunny sack and fill with coarse salt to place in bottom of fridge. Get a Hydrometer to measure the humidity. Add a tray of water to get the humidity to 60 - 80%. Place a large cut of rib eye or New York strip on wire racks. Wait at least 40 days. 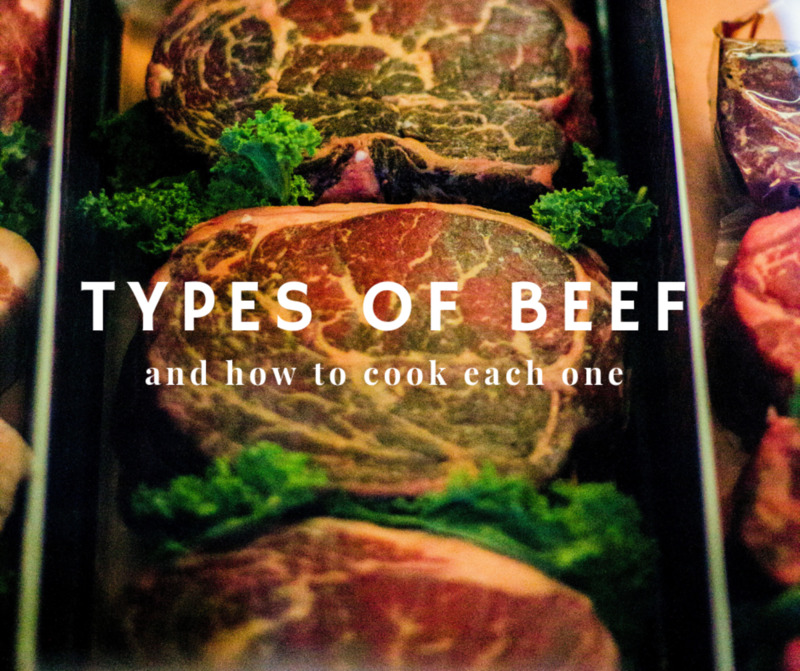 These guys are experts, and I’m aiming for beef that tastes like theirs. But it seemed a bit intimidating to get it all setup to produce a dry-aging environment like this. It cost $250 for the device. It won’t hold an entire sub-primal cut of beef. I also looked at a German-made Steak Locker. This $1,500 device is the total Cadillac of dry-aging fridges. It has all the equipment built-in, and every review I found touted it for producing great steak, controlling pungent smells, and cleaning. The two issues for me are the price tag and time it takes to get delivered. 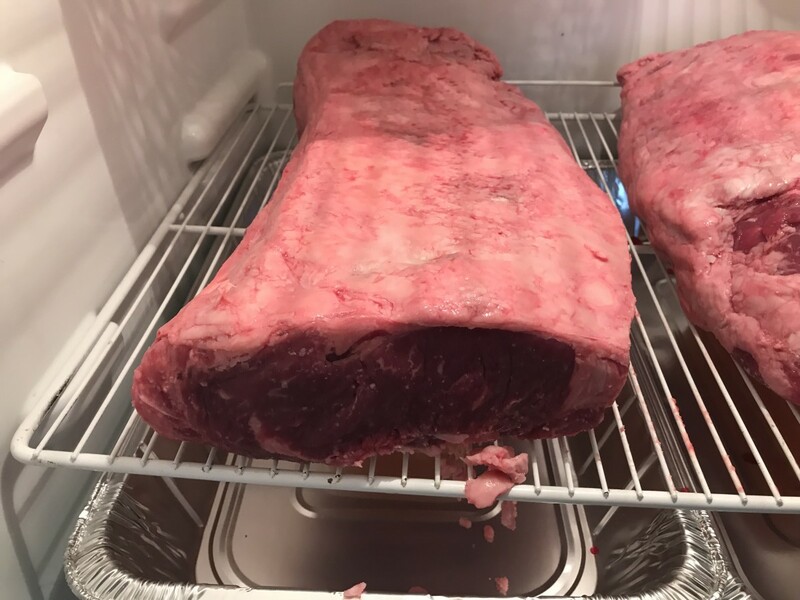 So, I was back to researching options and thinking through if I wanted to invest the time and money to do dry aging at home. I had two major questions. How important is controlling the humidity and the bacteria to the process? 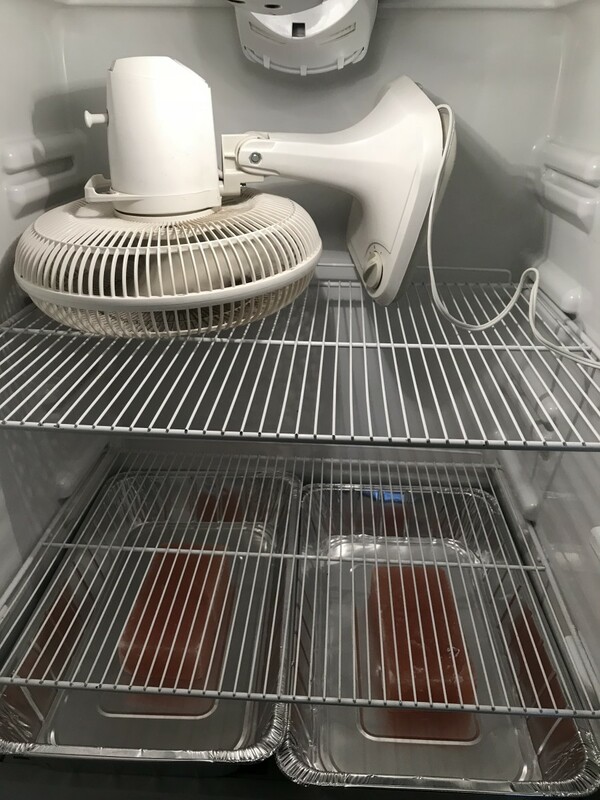 As my research continued, I found folks had gone to great lengths to control the humidity in a fridge that is virtually impossible to do without the feature built-in which is usually only available in commercial refrigerators. The second thing I learned about the impact of humidity is that during the dry-aging process, the outwe layer of the meat dries and seals. This process traps the remaining moisture inside the meat. So, the humidity doesn’t play a significant role in developing the flavor or preserving the meat. 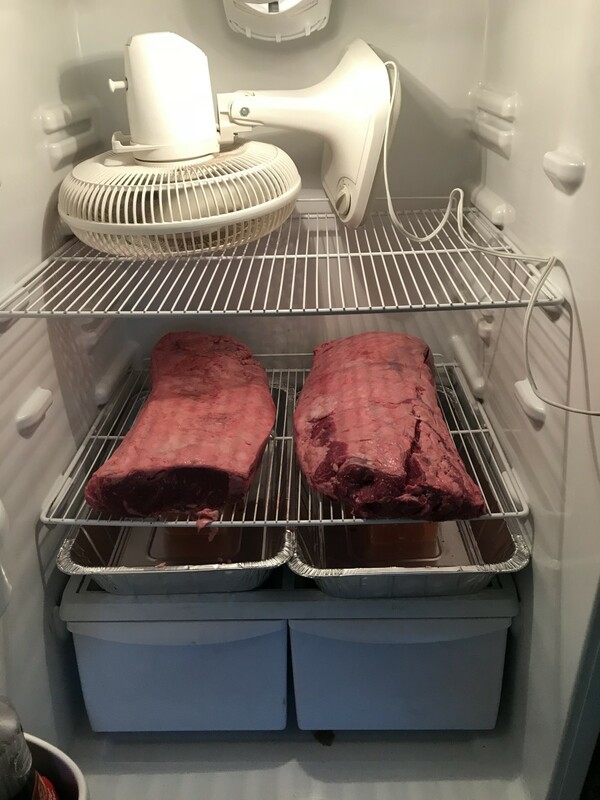 Numerous forums report outstanding results with dry-aging at home with Hygrometer readings of 30% to over 80%. Some people report fantastic results when they constantly open and shut the frig and humidity varies wildly. Net net, I decided humidity doesn’t matter for dry-aging. I struggled more with the issue of bacteria and if I needed a UV-C light. Once again I went to numerous forums and blogs and I found people reporting great results with and without, so I kept asking if it really mattered. I decided it couldn’t hurt, so I went to Amazon to get one shipped overnight, but I couldn’t find exactly what I was looking for, next I went to my local hardware store and once again I couldn’t find what I wanted, so I decided the steak gods were telling me I didn’t need it. So, I decided to proceed without a light. So, I decided to head To Costco to buy a $150 mini frig. When I found the fridge it was on a high shelf, so I couldn’t get it down. That’s when I decided to use my extra fridge in the garage. Here’s my setup. Some people cut a bit out of the refrigerators gasket to thread the fan power chord through, but I tested the seal with the door shut with the cord plugged in and it seems to close fine. 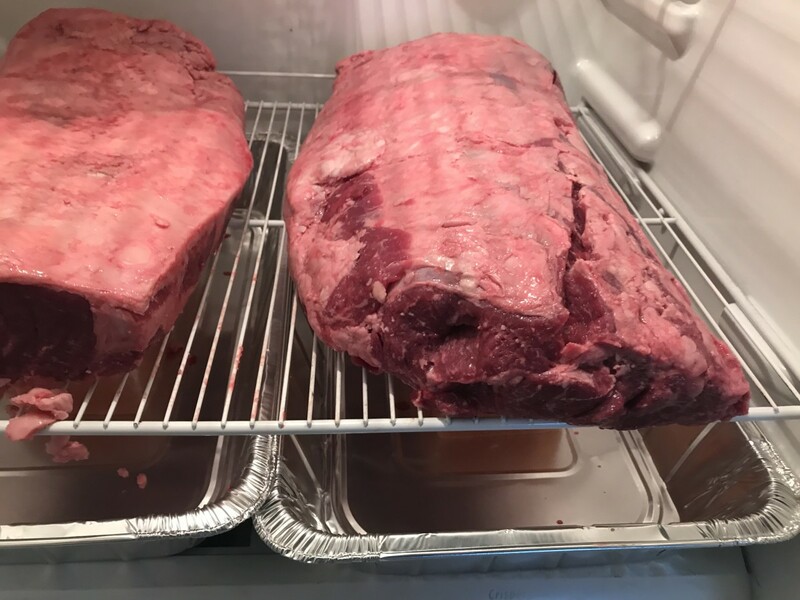 I got a thermometer reading of 40 degrees inside the fridge and that was within the target range of 36 - 42 degrees, so I figured, let’s do this and start dry-aging. Remove all other food from the refrigerator. The meat can absorb flavors from food. Also, very important is to either have grated fridge shelves or raised wire racks so the air can circulate around the entire piece of meat. Placing a large chunk of steak on a tray or plate had several reports of the meat rotting. Lastly, I added a salt block to each tray. 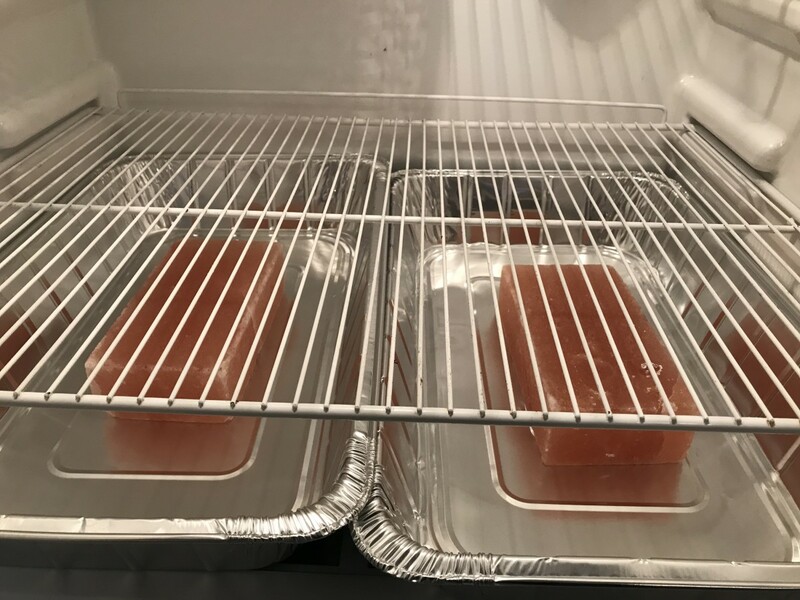 I had the salt blocks and wasn’t concerned about them absorbing moisture, but instead added them to add weight to the trays so they wouldn’t move out of place to catch any drippings from the meat. Since I was at Costco, I decided to buy a large New York strip and a large prime rib. Both were USDA Choice that cost $5.99 and $6.99 per pound. I went with Choice because it’s less expensive than Prime and I’m not sure that there is a huge difference in quality between the two. I placed both pieces on the rack, switched the fan on low and started the process. 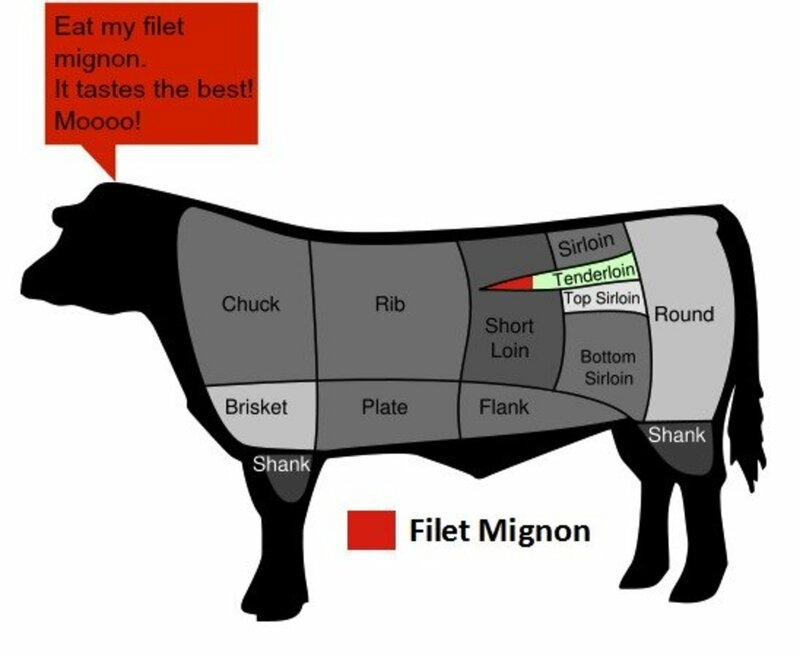 How Long Should Beef Age? The entire point of dry-aging is to create the most tender and flavorful steak. The fan circulates air around the beef, the outer layer seals in the juices and then the enzymes in the beef go to work slowly breaking down the meat to make it tender and producing the robust smell and flavor. 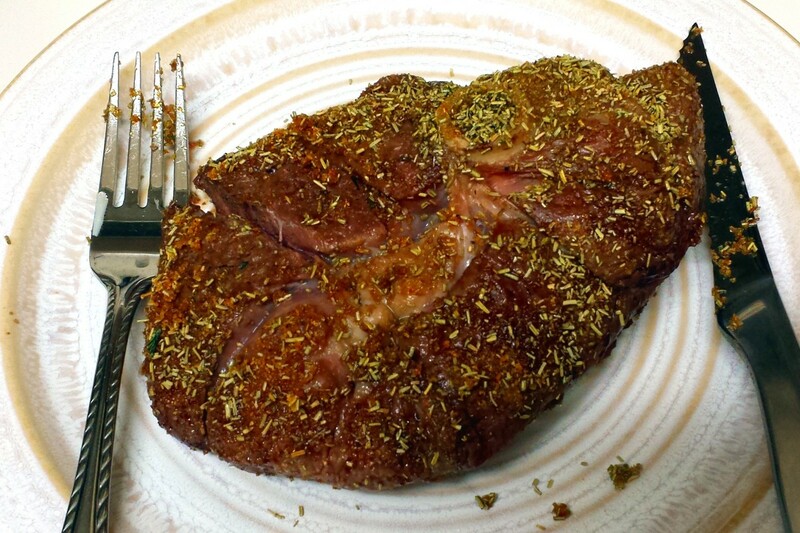 Once again, I poured over blogs, taste tested several steaks, plus relied on my experience. 1 - 21 days. Why bother. There is little to no change in flavor. If the steak is aged 21 days it only has a small hint of extra flavor. 22-28 days. Mild to medium increases in flavor. I’d still consider it hardly worth the time and trouble. 29-45 days. Robust flavor profile develops. There is a significant difference between day 29 and 45. Each day it gets more robust. 46 - 90. Yes, it keeps getting richer and funkier. My mother said it tasted rotten. I disagreed, but it was funkier than I liked at 65 days. Depending on personal preference I’d suggest aging 35 - 60 days. This will cover most preferences and for most people that enjoy a very rich piece of red meat, target 45 days. 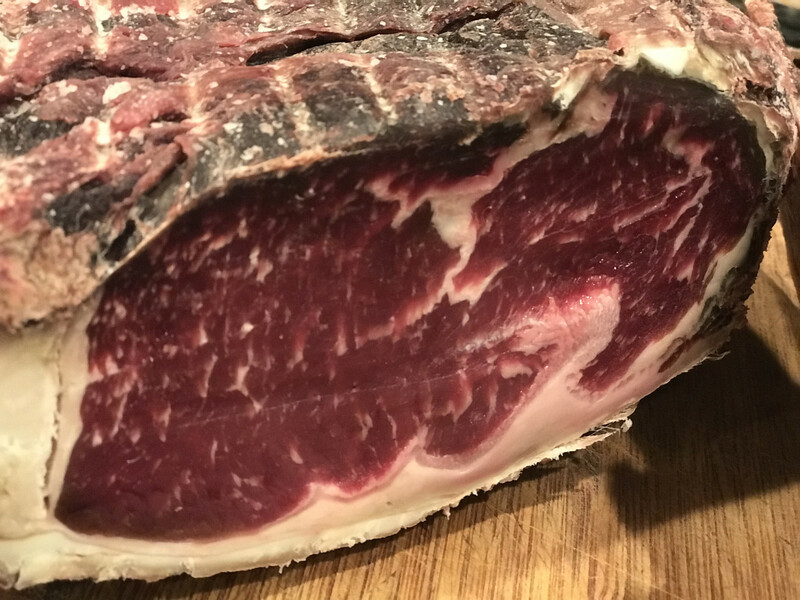 When it comes to selecting meat to dry age, buying a large piece that is untrimmed (all the fat still on) is preferred. For a Prime rib, I’d get it bone in if available. Pieces of meat with large fat layers are typically less expensive and they will preserve the yields. 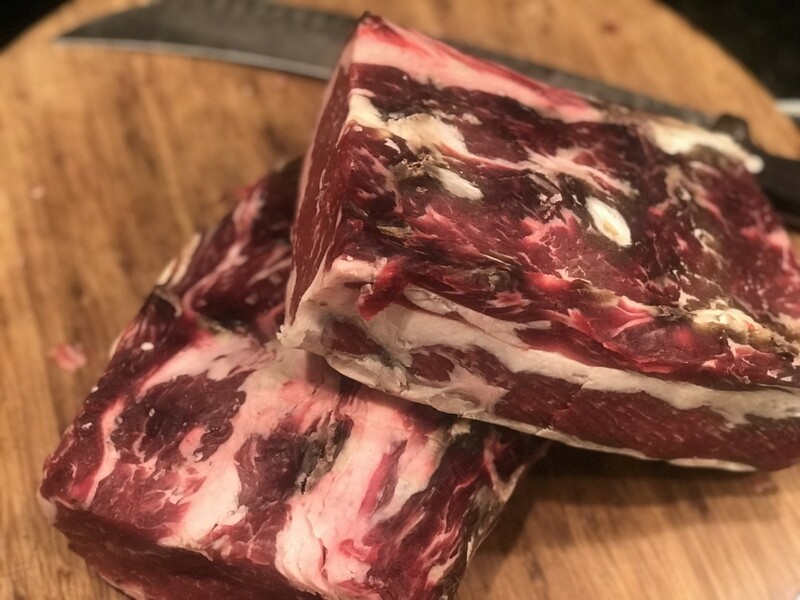 Many butchers say they charge more because dry-aging wastes up to 30%, but the folks at SeriousEats dispute this. They say that there is little meat loss because the fat is trimmed off at the end and that since meat seals, it stops losing moisture. This may be one of the biggest price gouging misnomers of beef eating carnivores to ever hit their wallets. My experience and research supports this for Prime ribs with the fat layer and the bones, there is actually little waist. As an experiment, I smoked beef ribs low and slow that started at the approximate same size. 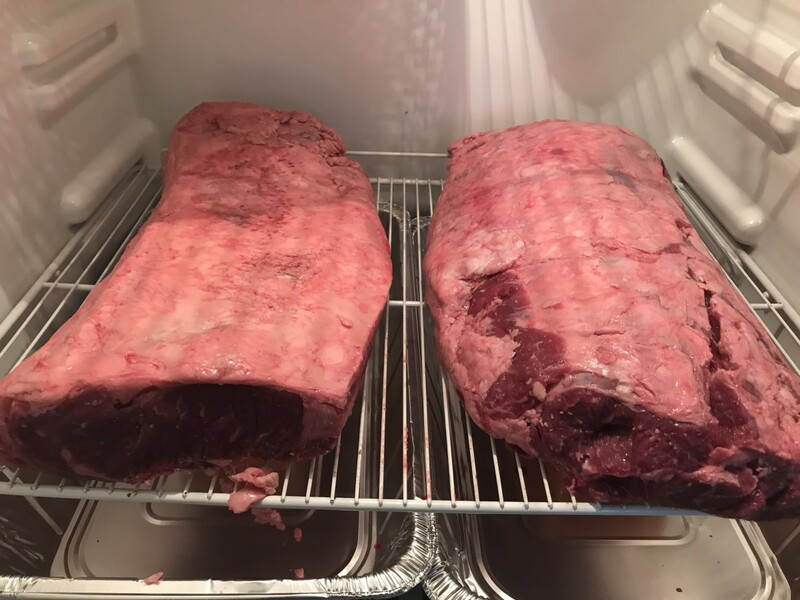 One set of beef ribs is aged 45 days and one is vacuum packed. Smoked, and braised both sets for four hours. 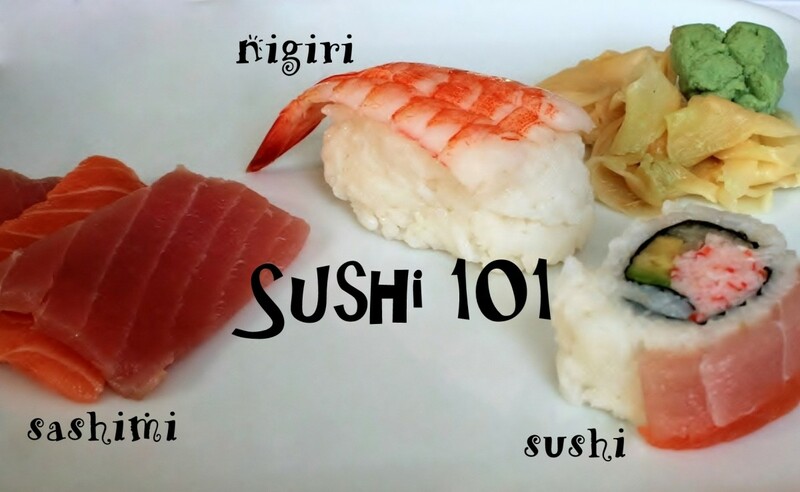 Although there is shrinking during the dry-aging process, the end result is just about the same amount of meat, but they do have different flavor profiles. The difference is the dry-aged beef shrinks less during the actual cooking because it starts with less water weight. 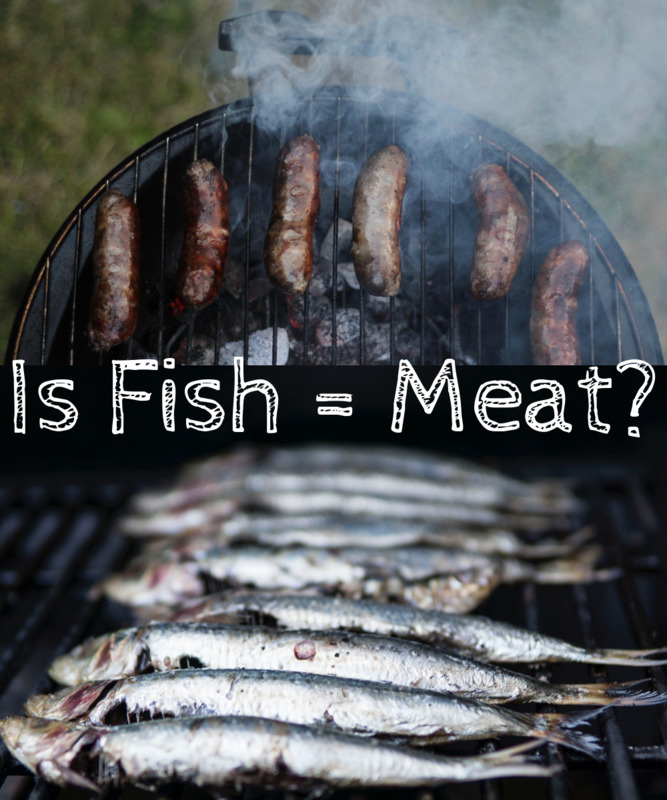 The net is the amount of meat is about the same after grilling. Fully trimmed rib eye dry aged at home ready to grill! 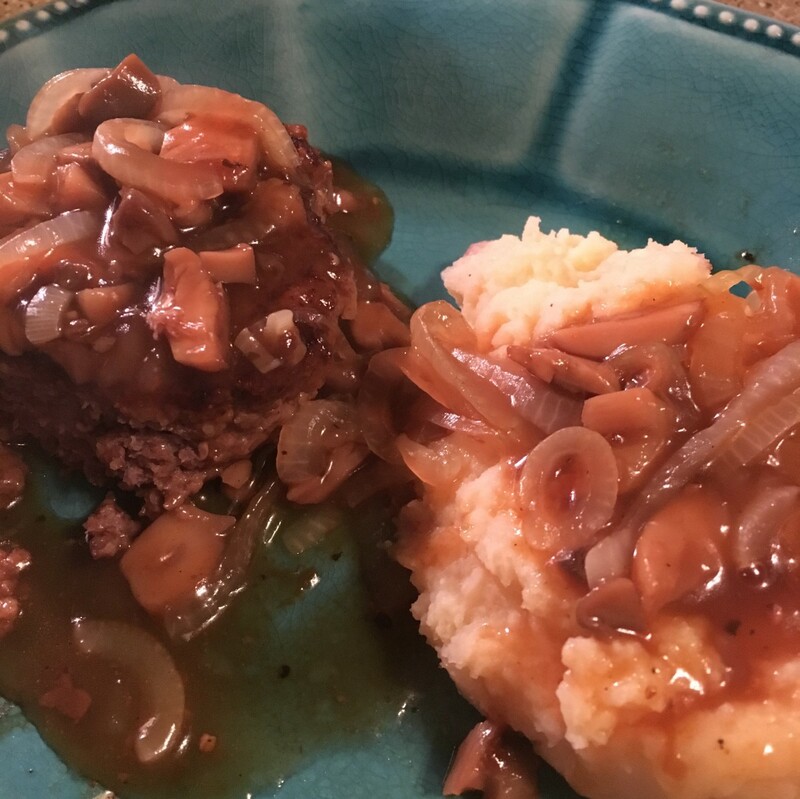 When I pulled the rib eye at 43 days, I jumped the gun by two days because I really wanted a great steak dinner and I had the time to prepare it. The first thing I noticed that the meat develops a tough rhine with some spots. I wasn’t sure if it was a fatty deposit or mold, but it was just on the surface. I’ve seen dry-aged meat done by professionals with these same types of spots, so I wasn’t concerned. It takes a really sharp knife to trim it. So, I sharpened my butchers knife and trimmed all the portions that were extra dark or appeared to be dried out from the circulating air. I didnt break the ribeye down to individual steaks, but instead chose to grill it as two roasts at a low temperature of 250 - 300 degrees seasoned with salt and pepper until it reached an internal temp of 125 degrees. Dry-aged meat cooks more quickly than regular steaks because more of the moisture has been removed through the aging process. It took about two hours and my prime rib roast was ready. Would my roast taste like the expensive butcher? Yes! It had the funky notes and it was very tender and extremely rich. The only bad news is it was so rich, I only ate two one inch sliced steaks. 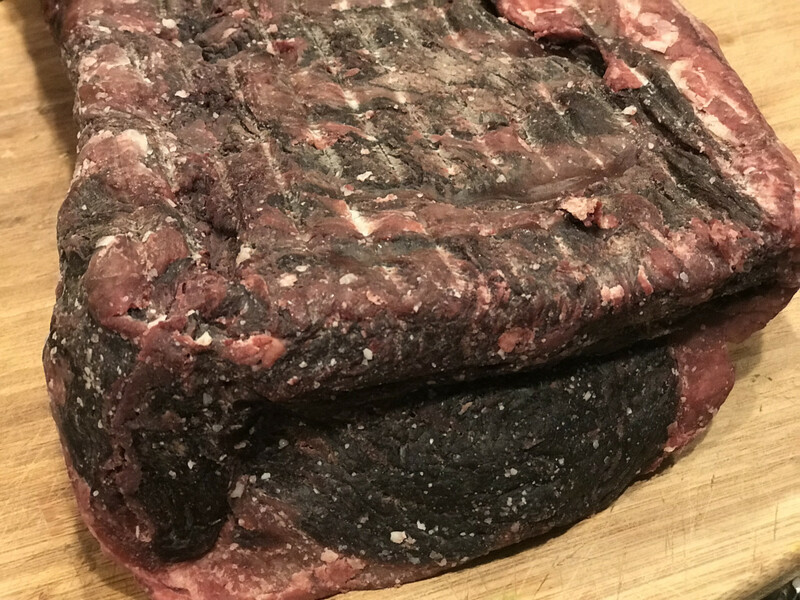 We invited friends over that are well versed in the flavor of dry-aged beef and they agreed, it had the same characteristics of professionally aged beef. My wife was still a bit nervous and she asked me if I thought we could get sick from it. I had trimmed off the parts that looked bad, but the steak was still a very dark red. I told her we would know the next day. The next day came and people wanted to eat more, so I figured it was a great success! 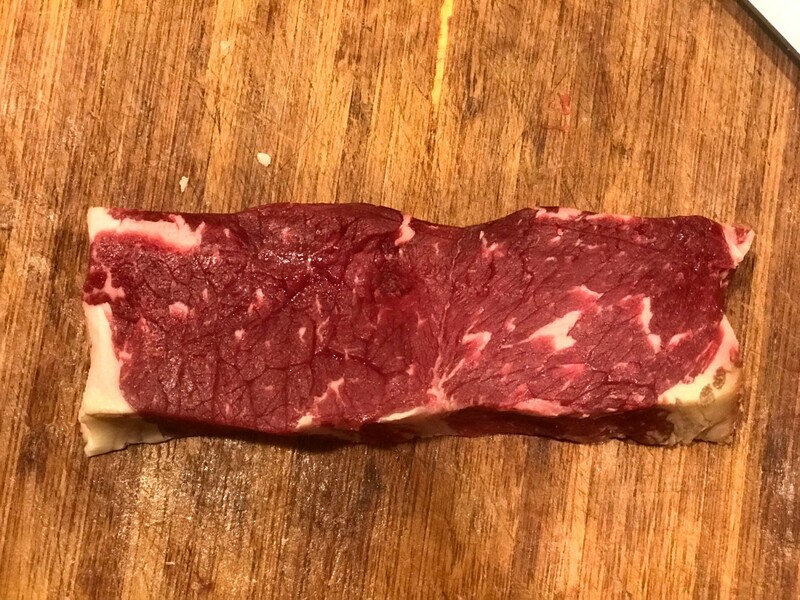 After 45 days of aging, there is still a small amount of blood in a trimmed steak. My wife prefers the leaner New York Strip steak to the fattier ribeye. Just her luck I dry-aged a whole strip steak. I pulled it at 45 days of aging. Once again, I sharpened my large butchers knife. Starting at one end I sliced off the end to get rid of the part that had been dried out to get the deep red portion exposed. Then I sliced it into about twelve 1 inch steaks. Then I trimmed off the edges of the steaks. There was quite a bit more waiste with the New York strips because the bottom of the cut was all lean beef. I cut off about 3/8 of an inch to get to the good part of the beef. The other side was almost all fat, so trimming that off didn’t waste any meat. Note to self. Research large cuts of beef that are surrounded by fat for aging. This way there will be little to no waste. On to the flavor. It’s incredible. Better than I expected. Perhaps the extra two days mattered or possibly there is a difference in the cuts of meat. 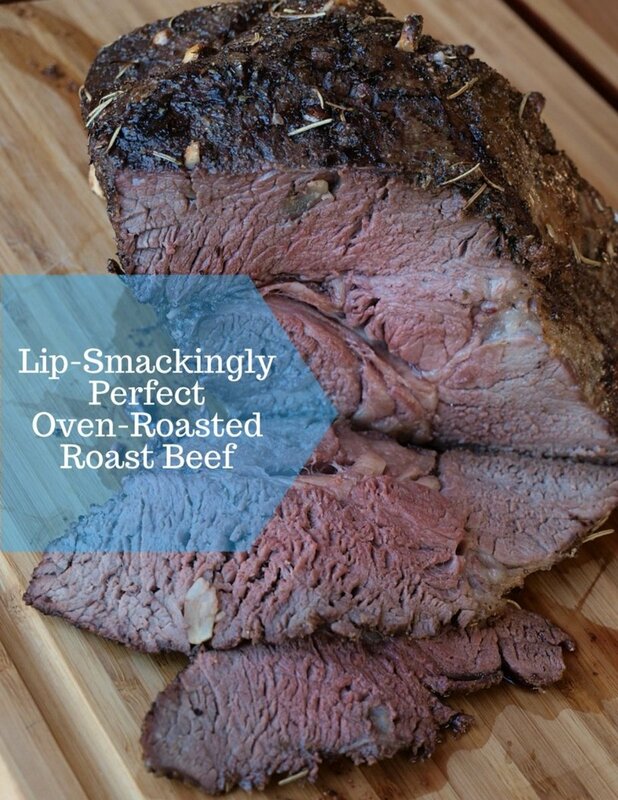 It has a hint of blue cheese and a nice musky flavor in each tender bite! So good. I'm off to Costco tomorrow to get two more large cuts of beef. Hopefully, a large bone in Prime Rib and another side of New York strip to stock the freezer! 36 votes so far. Click a star to add your vote! This is something I'd looked into. I found a humidity controlled box that fit in your fridge for $200. Seemed awfully pricey. I like your home rig better.